Many people just can’t wait for summertime to get their sunlight—and they’re turning to tanning beds to give them the nice, bronze glow they dream of. If you count yourself as one of these people, then you might want to rethink going to the tanning salon. 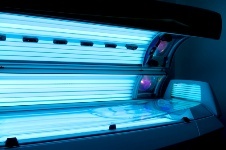 A new proposal by the Food and Drug Administration (FDA) wants all tanning beds to carry a warning sign—that they’re dangerous for anyone under the age of 18 and may cause cancer. The proposal comes after a significant increase in skin cancer rates. One in five Americans will suffer from skin cancer at least once in their lifetime—and more than 3.5 million skin cancers are diagnosed in the U.S. every day. Every year, the rates of melanoma—the most common type of skin cancer—increase by about two percent and this trend shows no sign of slowing down. The FDA is pinpointing the rise of tanning bed salons—which promote bronzing your skin at the high price of making you more at risk of developing skin cancer—as one of the reasons for the increasing rates of skin cancer. While I personally believe that the public deserves to be informed of the dangers before they use a tanning salon, much like cigarette packages now have graphic images on them, what I want to know is why the FDA wants the warning to say that tanning beds are particularly unsafe for those under the age of 18—tanning beds hurt anyone who use them, no matter your age. In fact, the risk of developing skin cancer increases by 75% when people under the age of 35 use tanning beds, so if anything, they should include a warning for that age group as well. Here’s more: in 2010, the World Health Organization said that tanning beds posed the same cancer risk as cigarettes and mustard gas. I know beauty comes at a high price—but I hope that my patients know that the price shouldn’t be this high. During Skin Cancer Awareness Month, which takes place every May, I want you to take the necessary precautions you need to make sure you don’t become one of the five Americans who will develop skin cancer this year. Wearing sunscreen every day (just choose a facial moisturizer that already has SPF in it) can cut the risk of melanoma in half. If you’re going to lie out in the sun, re-apply sunscreen every two or three hours and right after swimming. You can get just as burnt in the shade too—so make sure you’re covered up and protected even if you’re spending the day under the beach umbrella. “Skin cancer,” American Academy of Dermatology web site; http://goo.gl/vZlWs, last accessed May 10, 2013. “Ontario moves to ban teens from tanning beds,” CTV News web site, March 7, 2013; http://toronto.ctvnews.ca/ontario-moves-to-ban-teens-from-tanning-beds-1.1185549, last accessed May 10, 2013. Linton, M., “The truth about tanning beds is not pretty,” SUN News web site, February 7, 2011; http://www.torontosun.com/life/healthandfitness/2011/02/04/17159421.html, last accessed May 10, 2013.